Submit your enquiry online with images or email images and information to info@juliensauctions.com. Our experts will review the items you wish us to consign and respond with conservative auction estimates. Once we mutually agree on estimates, our specialist will send you a copy of our consignment contract for your review and walk you through our consignment process. Julien's Auctions facilitates multi-consignor, single owner and celebrity estate auctions. Our auctions regularly include memorabilia from Marilyn Monroe, Elvis, The Beatles, Muhammed Ali, Babe Ruth, and other icons of Hollywood, rock and roll and athletics. 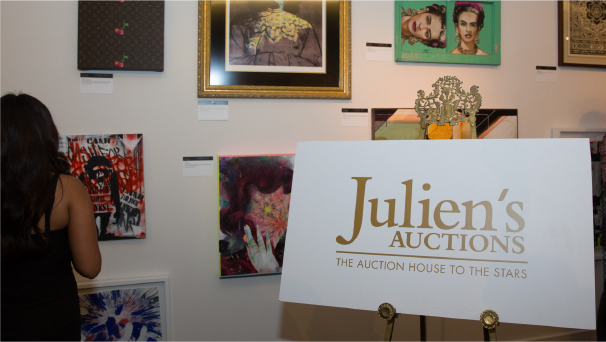 In addition to celebrity memorabilia, Julien’s is also the leading auction house in the burgeoning Street Art market; auctioning artwork created by Banksy, Shepard Fairey, Mr. Brainwash and Space Invader. We are currently accepting consignments for our rock and roll, Hollywood, sports and Street Art auctions. Please see calendar below for current auction consignment deadlines. info@juliensauctions.com or call us at 310-836-1818, and a consignment specialist can assist you. Why Consign with Julien's auctions? Julien's Auctions is established as the premiere auction house for celebrity estates, and individual consignents of Hollywood and rock and roll memorabilia. Our record-breaking auctions have guaranteed that Julien’s has the attention of collectors, as well as the media, from around the world. Our comprehensive database allows us to market our auctions to domestic and international collectors. Julien’s has conducted record breaking auctions for The Estates of Marilyn Monroe, Les Paul, Bob Hope, Greta Garbo, and Tony Curtis. As well as, single owner auctions of the collections of Ringo Starr, Barbra Streisand, Burt Reynolds, U2, Bette Midler, Cher, Bob Mackie, Elgin Baylor, Slash, and many others. We produce the highest quality full-color catalogs in the industry. These catalogs are mailed to top collectors around the world. Highlights from our auctions are exhibited in domestic and international venues such as The Beverly Hilton (Beverly Hills, California), The Museum of Style Icons (County Kildare, Ireland), Museo de la Moda (Santiago, Chile), design center (Chelsea Harbour, London), and aboard Cunard’s Queen Mary II, to name a few. Our auctions are also held at unique venues throughout the world. Past auctions have been presented at Ponte 16 (Macau, China), The Hard Rock Cafe Times Square (New York, New York), The Beverly Hilton (Beverly Hills, California), The O2 Dome (London, England), and The Palms Casino Resort (Las Vegas, Nevada). 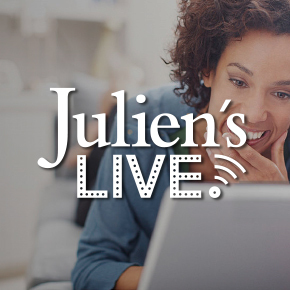 The auctions are simulcast live at julienslive.com, allowing bidders from around the world who can’t attend the live auction to view and bid in all of our sales. Julien’s Auctions receives extensive media attention, including regular appearances on the Today Show, Fox, CBS Early Show, Good Morning America, Fox and Friends, Fox News, CBS Evening News, NBC Nightly News, ABC News, MSNBC, CNBC, CNN, BBC, and covered by journalists from the Associated Press, Reuters, The New York Times, Financial Times, and London Times, among others. Contact Julien’s today to consign your property with the industry leader. Please contact a member of our team to discuss commission rates.